Bricks are built to last, but if you want them to remain in good looking condition, it’s important to know how to spot clean bricks. Subtle stains or eyesores can indicate underlying issues, and if caught on time, these issues can be resolved. Otherwise, small blemishes can turn into serious issues that reduce the longevity of your bricks. Even if the dirt on your bricks is 100% harmless, dirt and stains detract from the overall appearance of your home or building, making it appear run down or not cared for. Just like anything in life, your bricks need a little TLC from time-to-time. If the exterior of your building looks dull, dingy, stained or dirty, it’s time to spot clean your bricks. Efflorescence can build up over time or appear relatively shortly following construction. It is caused by the absorption of water, which naturally evaporates out of the wall and leaves behind white salts and minerals, known as efflorescence. 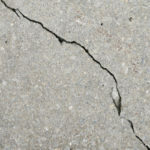 Certain precautions can be used when applying bricks to reduce the chance of efflorescence, but you can never prevent it entirely. 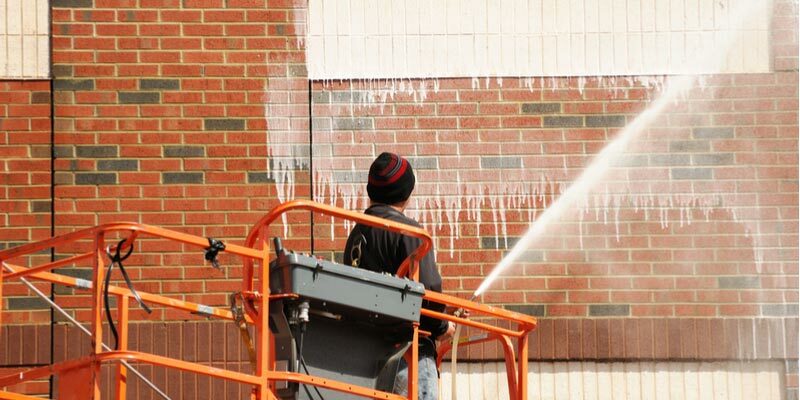 More than likely, at some point, you will need to spot clean bricks and remove efflorescence. Here’s a trick you can use to get the job done. Thoroughly rinse affected bricks using your garden hose. After you rinse the area, use a hand-bristled dish brush to gently scrub at areas where efflorescence is more stubborn or set-in. Rinse the area again before moving to step 2. Combine water and muriatic acid in an empty spray bottle. Make sure to tightly seal the spray bottle and wear protective gloves, goggles, and maybe even a breathing mask while applying the solution. Generously spray the affected areas with the solution, and then let it sit for a few minutes. After the cleaning solution has a few minutes to soak in, gather you scrub brush and work at the affected areas giving them a vigorous scrub. If the efflorescence is thick or set-in, it may take a healthy exertion of elbow grease to get bricks clean. After scrubbing the bricks, use your garden hose to rinse off any excess cleaning solution and make sure nothing gets left behind. If you have a dryvac, you can use it to help dry bricks. If the smell of the cleaning solution lingers, try adding some baking soda, let it sit for 15 minutes or so, and then rinse it off. Keep in mind, if efflorescence appears once, it is likely to surface again. Efflorescence is only one cause of brick stains, there are a lot of other stains that can impact your bricks. 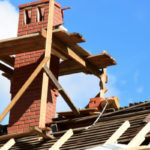 For instance, brick chimney stains that are black or tarry in appearance are likely caused by creosote and soot, which can leak through openings in a chimney or its flue. Additionally, green stains show the presence of algae. In some cases, white stains on bricks might not be caused by efflorescence, but instead paint pigment run-down. If you are ever unsure what is staining your bricks, call out a professional to ensure the proper steps are taken. Improper cleaning methods can badly damage bricks. 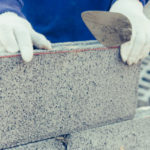 For instance, using a pressure washer to remove stains or spot clean bricks might remove surface stains, but it’ll also strip bricks of their top protective layer, leaving them vulnerable to more costly damages. Call Turnbull Masonry to Remove Stubborn Brick Stains! If stains, discoloration, or efflorescence are badly progressed or unrelenting, give us a call and we can assess the issue and provide the most cost-effective solution. 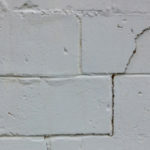 Stubborn brick stains may signal underlying issues that need to be addressed before larger issues have a chance to arise. There’s a reason we are Toronto’s number one masonry specialists, we get it right the first time around!